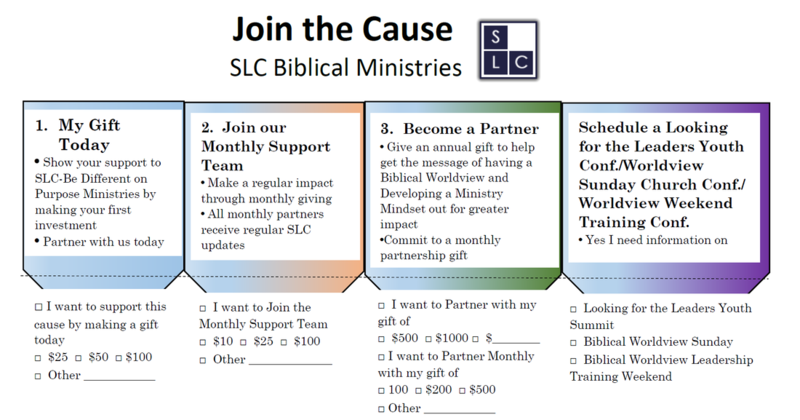 SLC Biblical Ministries (Student Leadership Conferences) is a 501c3 tax exempt, non-profit organization. Your gifts will be receipted and are tax deductible. You can click below to use PayPal and your credit card, debit card, or PayPal account. If you would like us to contact you about partnering with us, fill out the form below or give Matt Williams a call at 920-819-4540. Fill out the form below if you'd like us to contact you about partnering with us. Contact me about becoming a giving and praying partner. Contact me about scheduling a conference or Worldview Weekend I have a different question or idea I'd like to discuss.